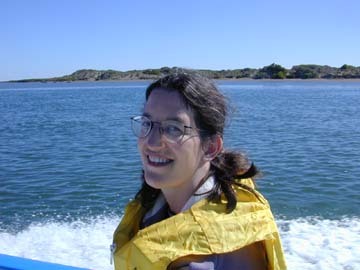 In January of 2005 we went on a week-long cruise around the Sea of Cortés. 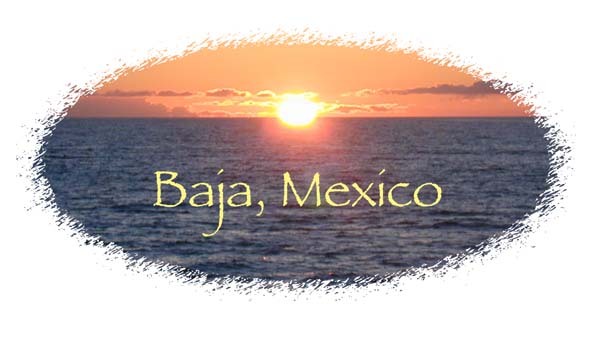 We started and ended in Cabo San Lucas on the southern tip of the Baja Peninsula, and our itinerary took us to several islands as well as the cities of Loreto and La Paz. 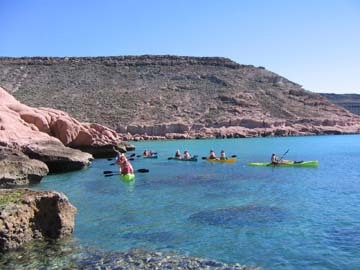 We enjoyed being out in the sun, hiking, snorkeling, kayaking, and seeing a lot of the interesting animals who live in Baja. 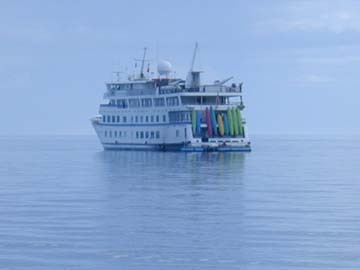 Our vacation was with Cruise West, which has small cruise ships holding around a hundred passengers each. 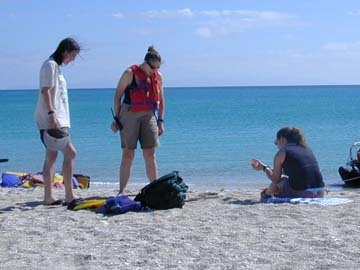 Their tours place a lot of emphasis on education and experiencing the wildlife, landscape, and culture of the surrounding area. We had traveled with them previously during our honeymoon in Alaska. We sailed on the Spirit of Endeavour which turned out to be quite a bit larger and more luxurious than our Alaska ship, the Spirit of Columbia. It had four levels, a dining room, an indoor lounge area, an outdoor viewing deck, and a sun deck. All of our meals were provided, but with moderate portions so that we didn't feel like we were overeating. We always tried out the desserts after dinner and enjoyed a dessert party up on the sun deck on the last evening. Without really telling us they were doing so, they upgraded us to a nicer cabin with a full viewing window instead of a porthole. It's hard to tell what perks were due to the upgrade, but the room was quite a bit more luxurious than we expected after our minimalist cabin in Alaska. We had a desk and a closet and a television and a phone. Even better, the toilet was not sitting inside the shower stall. 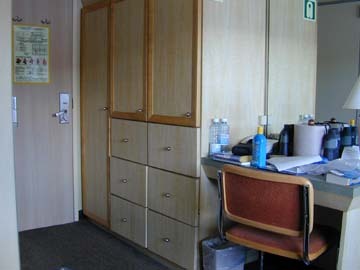 Left: Our cabin. Look... closets! We were definitely the youngsters on the cruise. With the exception of two teenagers and the young and hearty crew members, we were probably the only ones there under forty. We got a chance to meet most of the other passengers. Most of them were quite pleasant, but it was strange talking to everybody about their grandkids! The teenagers were part of a three-generation set of passengers. Their grandfather was actually the ship doctor, and their mother/aunt was a happy and enthusiastic woman who had traveled quite a bit in Mexico. 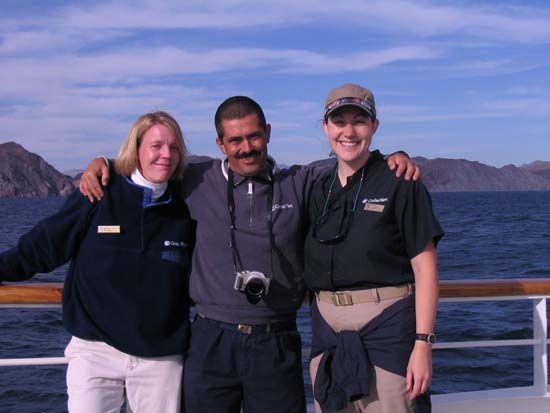 There were three on-board naturalists/guides: Jen, Meriwether, and Paulino. 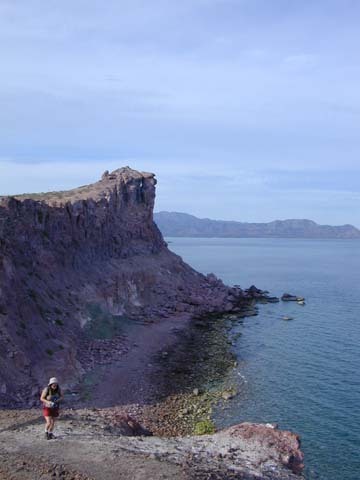 They all did a great job of keeping us enthused and teaching us about the history and nature of Baja. Every evening we had a recap session where people shared their highlights of the day. Our guides gave presentations after dinner, and one night we enjoyed a rousing game of Meet the Crew, a takeoff on the old TV game show To Tell the Truth. Meet the Crew was hosted by our captain, Dave; if he ever gets sick of being on the water, he could easily make a living as a stand-up comedian. There were also tours of the bridge and the engine room. The ship was all set up so that we could have fun in the water wherever we went. 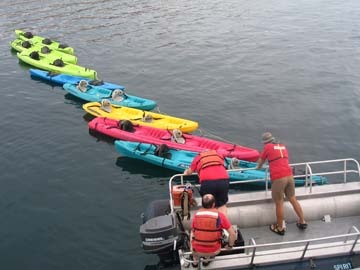 There were about ten sit-on-top kayaks stored on the back of the ship, and snorkeling gear and wetsuits were provided to all the passengers. 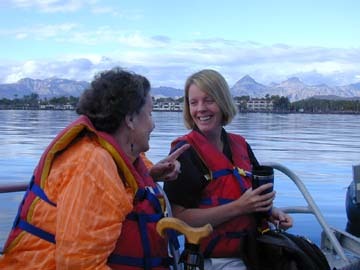 Since many of the beaches we went to had no place to dock, we often anchored offshore and rode in on DIBs (Demeree Inflatable Boats). Throughout the trip crew members and passengers pooled their digital photographs. Towards the end of the week, our captain created a beautiful slideshow from the best pictures and burned them onto CDs for anyone who wanted them. 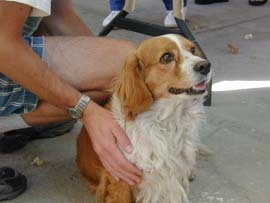 Some of the pictures on this page are stolen from the CD. I'll let you guess which ones. 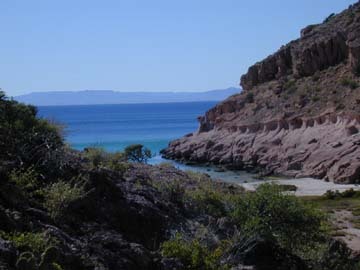 We spent our first day at Bonanza Beach on the large island of Espiritu Santo near La Paz. The entire three-mile stretch of beach was deserted until our arrival. The beach had a very unique character. It seemed to be composed almost entirely of dead critters. There was no sand to speak of, just shells in various states of decay. Some areas of the beach had very finely ground and polished pieces of shell, while parts had nearly intact shells. 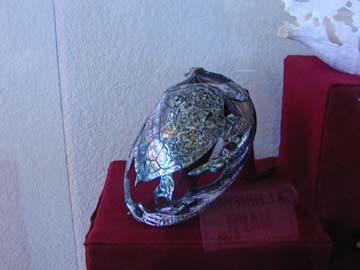 Besides the pretty shells were plenty of more startling creatures. We saw a pelican skeleton complete with the long flexible jaws, lots of fish spines, the spiky remains of puffer fish, sea urchins, the sharp-toothed jaw of a Moray eel, hermit crab shells with their deceased inhabitants still inside, and on and on. We went on a nature hike led by Paulino, and kayaked for a while along the rocks. The water was quite clear, allowing a good view of all the brown sea urchins below the surface. The real highlight for Julie were all of the Sally Lightfoot crabs on the rocks. Not only are they very colorful, but they are unexpectedly fast and agile. 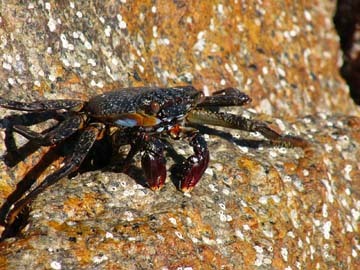 They can actually jump quite a distance (about a foot or two) from rock to rock. It was a riot to see one after another leap effortlessly through the air. Apparently they are nearly impossible to catch, and Jen said that she very rarely sees signs of them being eaten by seabirds. Behind the scenes there was another adventure taking place. Two passengers missed the start of the cruise by several hours due to the huge snowstorm on the east coast. 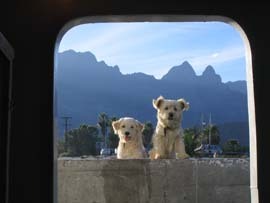 Cruise West took excellent care of them; they transported them up to La Paz and had a hotel room waiting for them there. The next morning while everybody was enjoying themselves on Bonanza Beach, the captain rode for an hour by DIB to pick them up. Now that's service! 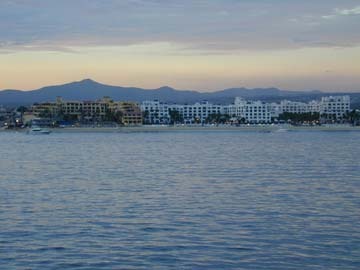 The next morning we docked at Puerto Escondido, which looked quite pretty as the sun was coming up. 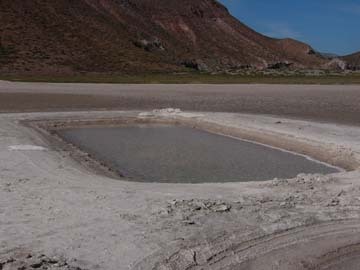 We took a 1-1/2 hour bus ride across Sierra de la Giganta to the Pacific coast. 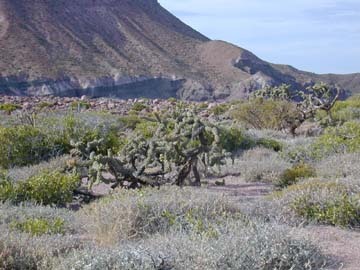 The scenery on the ride consisted of cacti, of all different varieties, densely covering the landscape. 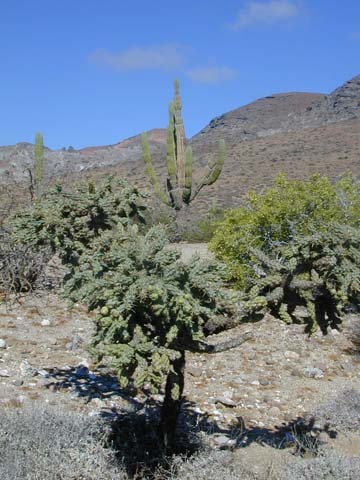 The cord�n were particularly impressive; they are the tall ones with two or three vertical branches that you typically see in depictions of the desert. 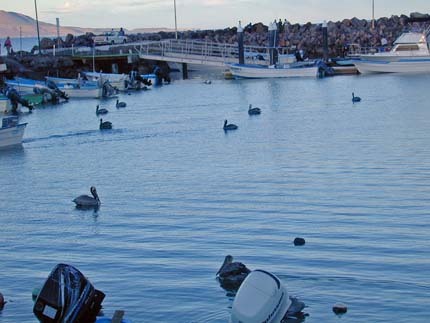 We arrived at Puerto Adolfo Lopez Mateos on Magdalena Bay to look for gray whales. 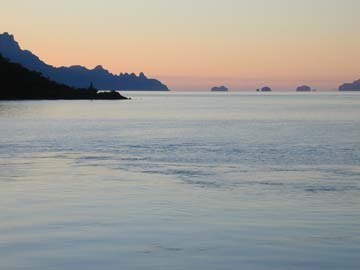 Every winter, the gray whales migrate down to the waters off Baja. Bah�a Magdalena provides a sanctuary for mothers and their newborn calves. We went out on little motorboats called pangas. Our panga driver had no problem finding whales. We probably sighted about eight whales in all, but our driver hooked up with a mom and her baby for a long time. Because the baby wasn't ready for long down times, they stayed close to the surface and came up for air every minute or so. It was easy to follow them when they were below water; as they skimmed beneath the surface they left rings of smooth water in their wake. While it was exciting being so close to the whales and for so long, we felt guilty about how closely our driver was tracking them. 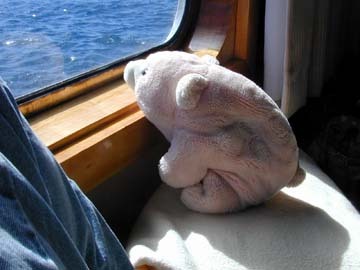 It was a very different experience than on previous whale watching expeditions, where the ships always maintained a respectful distance. Our mom and baby didn't seem to be doing too much to fend us off, so hopefully they weren't traumatized by the experience. 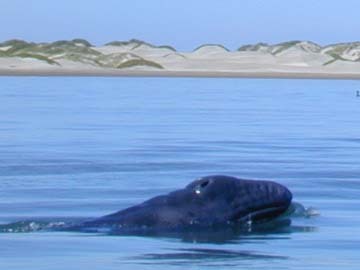 A few gray whales do actively seek interaction with humans. Some of the other pangas met these friendly whales and got close enough to touch them. After whale watching, we all went into town to have lunch at the Ballena Gris. With a bit of free time afterwards, the two of us walked back towards the water. It was an interesting little town. There was no effort at landscaping (presumably because of the scarcity of water), so everything had the brown dusty feel of the surrounding desert. 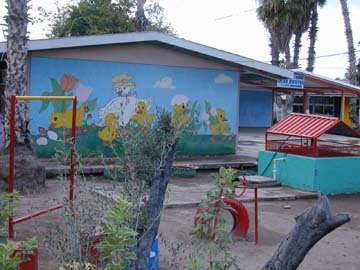 Instead, they brightened up the buildings by painting them in bright colors. The schoolhouse there and everywhere else we went received particular care. 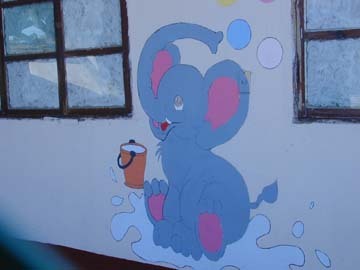 Every kindergarten and elementary school we saw had walls covered in cheerful murals. The kids we passed seemed energetic and happy. 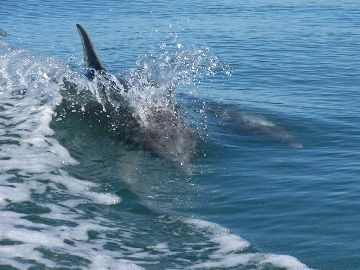 Having had our fill of gray whales, what better way to enjoy ourselves than to go out looking for more whales? 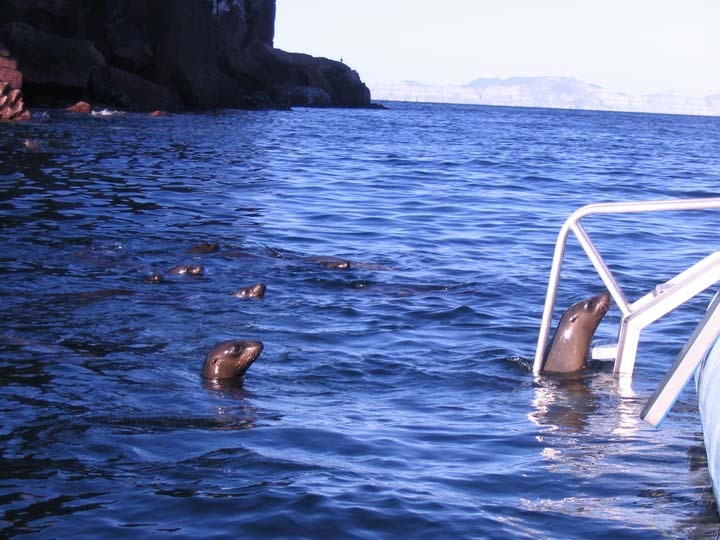 We spent the next morning meandering around the Sea of Cortés looking for large marine mammals. We had fantastic luck early on. 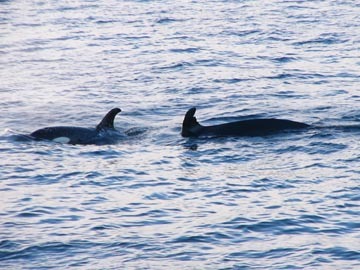 We ended up in the middle of a pod of around a dozen orca whales. They all seemed happy to play not far from the boat. Joel was downstairs in our cabin at the time, and he had a nice level view of them through the window. After that, we tracked a large baleen whale for quite a while trying to identify it. It was hard to get good visuals because it only came up for two or three breaths every ten minutes. But somebody eventually got a good picture of it, and our guides proudly announced that we were seeing a blue whale! At one point it was hard to decide between keeping an eye out for the blue whale on the port side or watching the pod of playful dolphins on the starboard side. We spent another afternoon relaxing on the beach. Julie went snorkeling near some rocks and saw several schools of fish, lots of sea urchins, and some more Sally Lightfoot crabs. 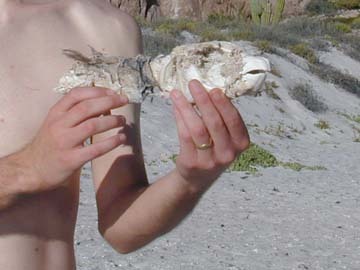 This beach wasn't 100% shells like the one on Espiritu Santo, but it still had plenty of treasures: a nearly complete snake skeleton with head and jaws, lobster shells, pike fish, cornet fish, and so on. Julie found what turned out to be the egg casing of a moon snail, made out of sand and saliva. At first it was difficult to tell if it was natural or man-made; it felt like rubber and looked like a piece of sandpaper shaped into a helix. Joel went with some other hikers across the neck of the island to another beach, and then up a ridge overlooking the ship. 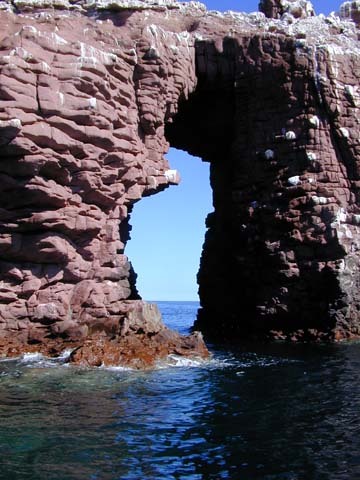 The rock formations on the island were quite pretty and the wind whistled through the passes. In the lowlands, they walked across evaporated salt crystals. At the far beach, they saw many almost intact sea urchins exhibiting the "Archimedes' lantern" apparatus attached to the teeth. 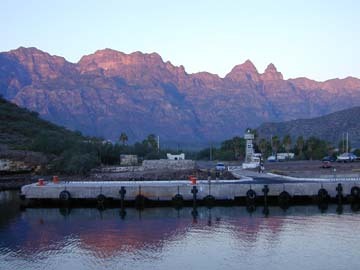 We spent a day in Loreto, a tiny fishing town with about 15,000 people. 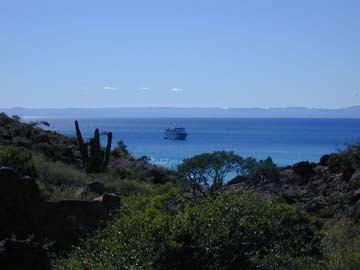 Loreto was the site of the first permanent Spanish settlement in Baja. We took a tour of Misi�n Nuestra Se�ora de Loreto and then were on our own for the afternoon. Loreto is a cute little town. It appeared to have one main street with a bunch of shops and restaurants. 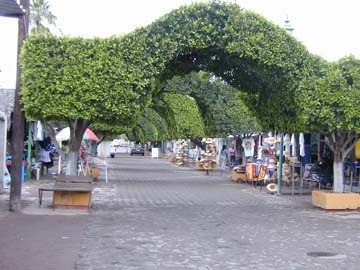 The next street down, with the Mission, had a lot of craft stores and was very nicely decorated with arches of greenery across the street. We had lunch at a little restaurant called Mexico Lindo and successfully used a few words of Spanish with the waiter. We bought some tiny items in the craft stores. Joel went in search of a wet suit but didn't have any luck finding one small enough to fit. 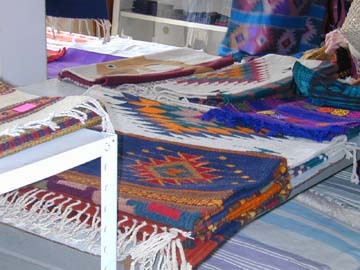 The people made us feel comfortable, treating us as if we belonged there rather than as tourists. 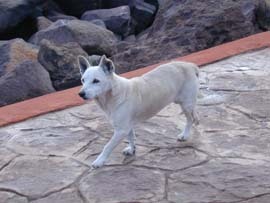 There were cute dogs in every city we visited, as well as a bunch of sleepy dogs having siestas. We couldn't help but take pictures of them. 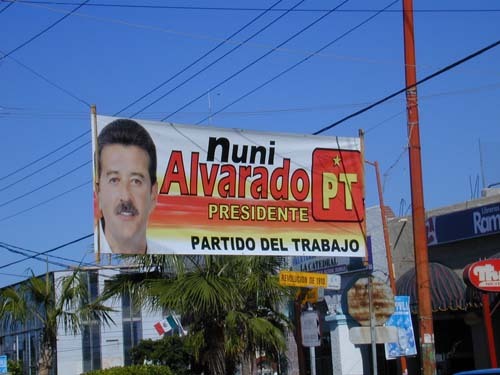 Campaign posters for the February 7 election were also ubiquitous. Moreover, Loreto was crawling with campaign cars that blasted music onto the streets. By the end of our trip, Julie was all ready to pick the cutest candidate and vote for him. In the evening we went to a wine and cheese reception with a mariachi singer. It wasn't quite our thing, but the rest of the guests had a ball... especially all the elderly gentlemen the singer flirted with. A sudden rainstorm sent people running for cover for a few minutes in the middle of the performance but the singer just kept on going. There was a nice moment during the reception when dozens of turkey vultures started circling overhead. As we walked back to the boat, we saw two rainbows and a beautifully lit sky. 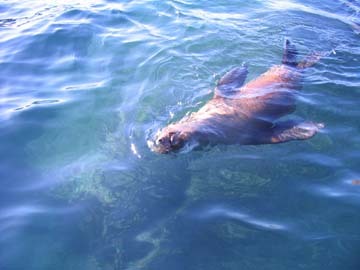 The real highlight of the trip was snorkeling with sea lions. 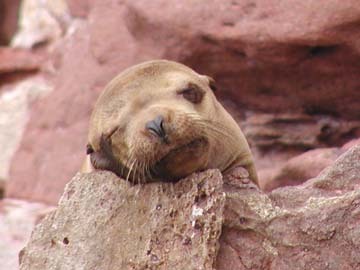 Los Islotes is a tiny little island completely inundated with sea lions. We anchored offshore and went snorkeling not far from the rocks. 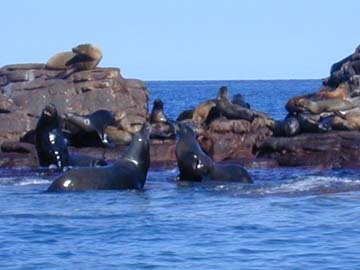 The large adult males stayed on the rocks sleeping and defending their territory. But the curious young pups all swam out to check us out. Julie got the jitters the night before, but once she got in the water it was thrilling. The graceful pups swam all around us, and with our snorkel gear we could watch them diving down and wrastling with each other underwater. A few of the snorkelers got nibbled on a bit; nothing serious, just startling and funny. 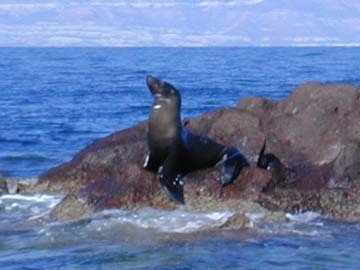 Every once in a while one or two of the sea lions would go into crazy mode and start leaping back and forth out of the water. After snorkeling we took a leisurely DIB ride all around the island to enjoy the sea lions and the many types of sea birds. After the sea lions, we spent a warm and relaxing afternoon on the beach at Isla Partida. The water there was a very clear green. Julie lay out in the sun and then went on a kayak ride with Jen. 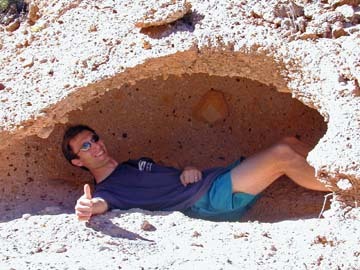 Meanwhile, Joel went on a boulder scramble led by Meriwether. The hikers were a hearty group and made it almost to the top of the cliff; Meriwether was so proud of them! 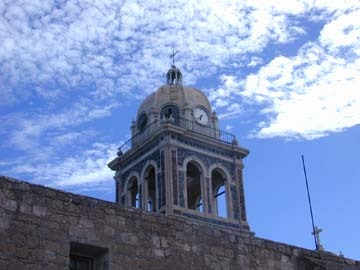 Our last full day was spent in the large city of La Paz. 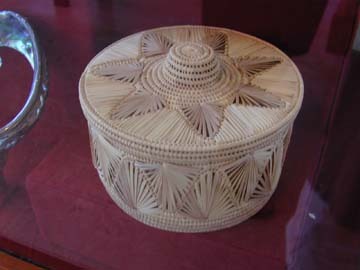 We went on a tour of the city which took us to a weaving factory (all done with hand looms and other human powered tools), a church, the cultural history museum, and a pottery store (again with only hand-powered equipment). 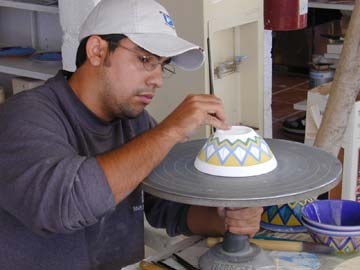 The pottery was particularly colorful and playful, and Julie was tempted into buying a few little things. The beachfront in La Paz was quite nice. We could stroll for quite a ways along decorated pathways with benches and playful statues. In the evening we all went to a fiesta with dancers and a pi�ata. Transportation strike in Cabo San Lucas! We had one last bit of excitement before returning home. 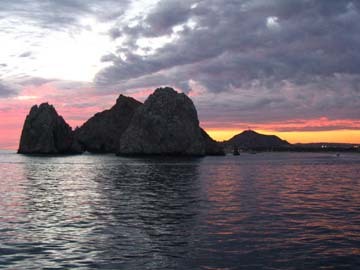 The evening before we were to depart, our crew was informed of a one-day transportation strike in Cabo San Lucas. In particular, the chartered busses that were scheduled to bring us from the dock to the airport would not be running. Cruise West was terrific under these unforeseen circumstances. A lot of crew members and other employees scrambled behind the scenes to line up enough taxis for us all. It was predicted that the ride to the airport could take three hours, so we sailed full-speed all night to make it into port early enough for people to catch their flights. Jen did a great job of communicating new developments to the passengers but not making us feel panicked. We left in our taxi fairly early and were going along just fine until we hit a huge line of traffic along the coastal road. After about an hour of crawling along, we finally determined the problem. The strikers in their vans and busses were lined up shoulder-to-shoulder driving at a leisurely 20mph or so. In general, people seemed to take the situation in stride, so a sense of controlled chaos prevailed. The one thing that was truly bizarre, which we would never imagine seeing in the U.S., was the daring decision to lay claim to one of the two lanes going in the other direction. Whenever convenient, cars would simply cross over the divider. Before long, we were solidly in control of three lanes of highway. There was a small amount of police presence, mostly to keep people safe and to prevent gruesome head-on collisions. They didn't seem to be doing anything to stop the slowdown itself. In case you're worried about us, we did make it back to the airport in plenty of time and had a pleasant flight back to San Diego.